You are here: Home » New Outlook » What Makes Donna Run… and Jump, Shoot and Putt? It’s not many of us who can say they know a president of a national sports organization. But for the members of the sisterhood of the Jacksonville Jewish Center, Donna Orender is just that. 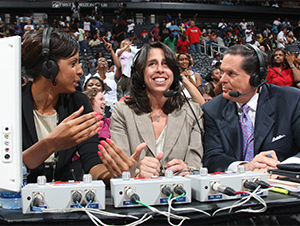 Donna has spent a lifetime navigating uncharted waters in the field of sports. But be-fore serving as president of the Women’s National Basketball Association (2004-2010), she was an All-Star in the Women’s Professional Basketball League. She also played on AAU teams and even in the famed Rucker League in Harlem. 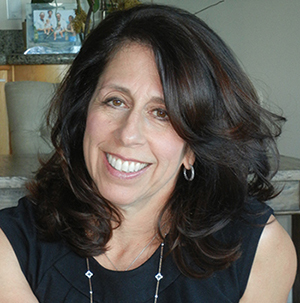 Donna’s love of sports goes goes back to when she played for Elmont High School, Elmont, NY. 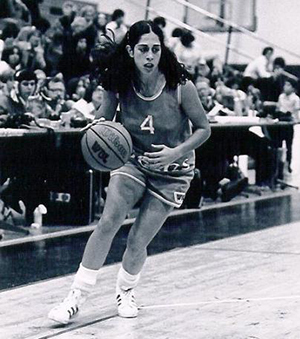 She was an All-American basketball player at Queens College of the City University of New York where the coach, Lucille Kyvallos, was one of the best in the nation. Donna only wanted to play at that elite level. Basketball isn’t her only sports infatuation. Donna spent 17 years at the PGA Tour where she launched the production company that worked to strategically grow its global production, television and digital businesses before being promoted to the office of the commissioner. In 2005 she was named to the Sporting News’ Annual Power 100 and as one of Fox Sports.com’s 10 Most Powerful Women in Sports. When she moved to Jacksonville from New York in 1990, she was a single young woman on her own. One of her first stops was the Jacksonville Jewish Center where she found the same kind of close community she had enjoyed on Long Island. “I would sit in the back and it would make me feel at home. I could feel the presence of my grandparents in particular and a sense of place and comfort.” She was soon “adopted” by a local family who have been with her for every life milestone since and the synagogue is still a pivotal part of her life. From her grandparents, all first generation Americans, to her parents, her ties to her Jewish heritage run deep and she hopes to instill that love of Judaism in her twin sons, who attended the Martin J. Gottlieb School, a Solomon Schechter school in Jacksonville. “We feel strongly about grounding them in Jewish values and community, as well as giving them a deep and abiding connection and responsibility to their roots.” Not surprisingly, her sons played basketball and the family has been involved in the Maccabi USA movement. Marching together into the Teddy Stadium in Jerusalem in 2013 as members of the USA delegation was a highlight for the entire family. Today, Donna is CEO of Orender Unlimited, but her real passion is in creating broader understanding for women and girls and developing deeper opportunities for them. Often honored for her dedication to community development, her proudest accomplishment is Generation W. A national movement now in its sixth year, Generation W is a full-day conference designed to educate, inspire and connect women and girls. Women’s League is proud of members like Donna Orender. Let us know about other women in your sisterhood who are making a difference in the world. Write to womensleague@wlcj.org. Wonderful article on my teammate and friend, Donna Orender. We played basketball together at Queens College and also in the professional leagues. She has always been a great role model. I cheer her success and her commitment to advancement of girls and women in sports and business. Donna began her journey at Elmont Memeorial HS where she was able to forge innovative thinking by advocating to become a player on an all male sports team ! She succeeded then and continues to excel and make a positive impact on the world !!! Congratulations and Mazel Tov on all of your accomplishments !! !